I've been talking about so many beauty products on this blog: My makeup routine, my face routine, my hair routine, my skin care routine,... but never did I mention the products I use in the shower. Let's catch up on this today, shall we? With a current 10 products I don't use little stuff to get that body clean and shiny, but of course everything has its own purpose. 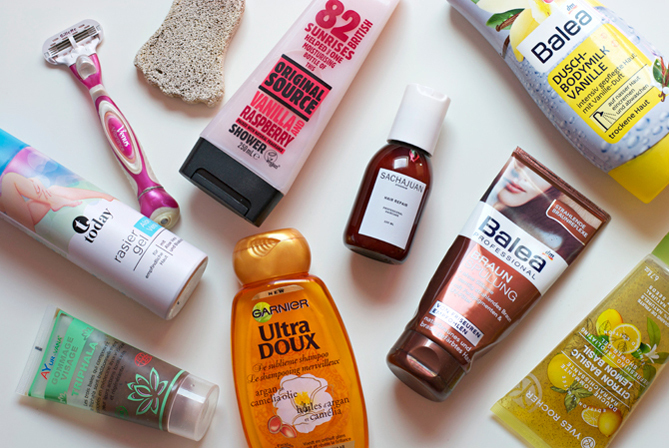 While some of the products are returning visitors, there are also a few brands I only just discovered or products I'm trying for the first time. I'm taking a little break from the Gilette Satin Care shaving gel, and trying this German supermarket brand. When it comes to texture and smell it's just as good as my favourite. The Venus Vibrance was the first razor I got and I'm still having it. You can use all Gilette blades on all razors but I mostly stick to the original Venus Vibrances ones, which work just fine for me. I exchange them after about three shavings. I like to use face scrubs regularly but I find it easiest to use them in the shower, which is why I always store them there. I use them about twice a week and currently it's still the Ayurvana one, which I have reviewed before. This is one of the products I'm only just discovering. I really like that Orginal Source products are vegan and come with natural scents. And in fact this one couldn't smell of vanilla and raspberry in a more natural way. Here in Luxembourg I always have the feeling that the shampoo range isn't really big (mainly because I'm missing my beloved Balea products), so I always go back to the Ultra Doux range, which I've already loved as a child. I'm still having this one from before I went ombré so it needs to be emptied now. Though as I already said before there are better products for brown hair, like again from the Ultra Doux range. I got this as a sample and I would never have bought it myself as from the beginning I knew it would work. I don't know about your countries but in Germany these body lotions to use in the shower were a huge hype last year. Obviously they can never be moisturizing enough for really dry skin and so I just use it for extra care from time to time. Unfortunately compared to the Original Source shower gel, here the smell of vanilla is pretty artificial. I've already introduced you to this scrub before and even though it's nice and refreshing for summer, I already have my eyes on a more effective scrub. Last but not least a shower staple of mine is a pumice stone which I use about every week during summer. It's so easy to use and much more gentle than products you would use on dry skin. Aww thanks so much, I'm glad you like it!! Tolle Produkte, die Balea-Duschmilch riecht sooo gut! The Original Source shower gel smells sooo good!